Viralisme Blogger Template is specially designed for those, who are looking for a magazine style theme for their viral website. As you know that viral websites are one of the best and fastest way to make money from your site. If you own a viral blog then by placing ads on correct ads spots. You can generate some handsome revenue from your blog. So Viralisme blogger template will not only make your site more creative. But it also comes with many other advanced features. We highly recommend using a viralisme blogger template because it has a responsive and fast loading design. As you know that if your web pages load faster than other sites then users will always love to browse your site next time. So having a site with fast loading design is always a great idea. You can easily make your desired modification in the design of this SEO friendly template and customize its options according to your needs. 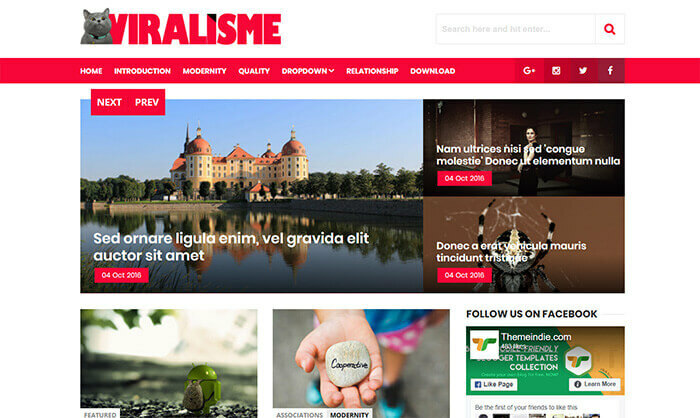 If you take a look at the design of viralisme blogger template then you can see that it has a beautiful menu bar then you can use to link your most popular categories. You can also link your social network profiles to increase your social followers. It also has a beautiful search box in the header section that helps your readers to search anything from your blog quickly. You can also place ads on your desired places and maximize your revenue.